Adults slender, about 8 mm long, pale brown, narrow head with large eyes and long antennae. They are a fast moving general predator which feeds on moth eggs and small larvae. In sweet corn they are often seen in the whorl in pre tassel stage then the tassel and latter around the cob and silk area. 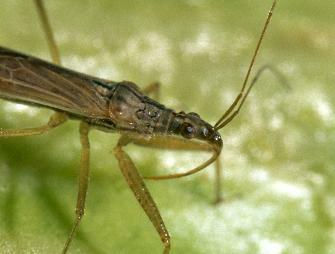 Damsel bugs are voracious feeders of cabbage moth larvae and are able to move into difficult to spray places. 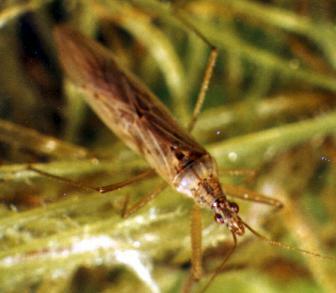 Damsel bugs move quickly when disturbed. Methods for using damsel bugs are currently being developed. For varieties that are highly susceptible to cabbage moth releases are made at the seedling stage.